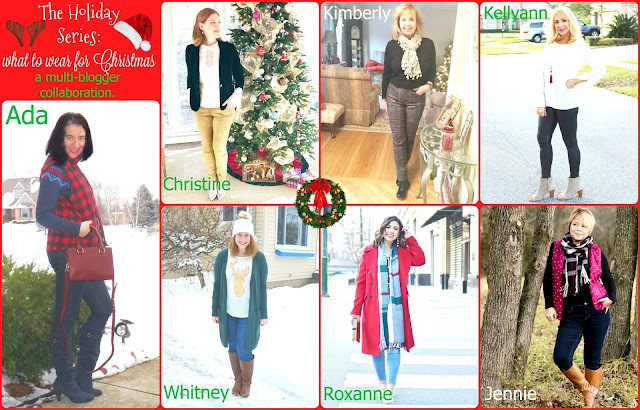 The Holiday Series: What to Wear for Christmas, a Multi-Blogger Collaboration. 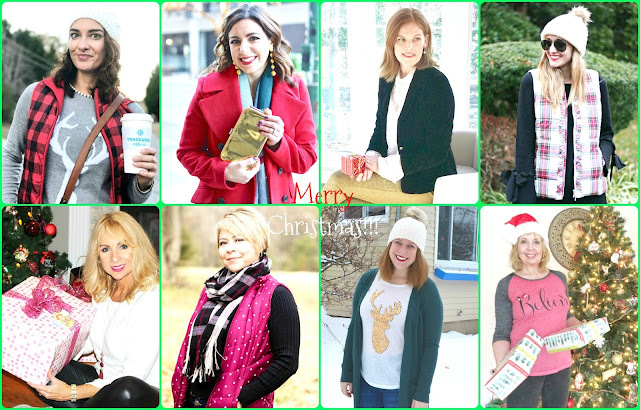 If you aren't new around here, you probably know that over the last few weeks, I have been collaborating with a bunch of blogger friends for "The Holiday Series" which was my idea about a multi-blogger collaboration. 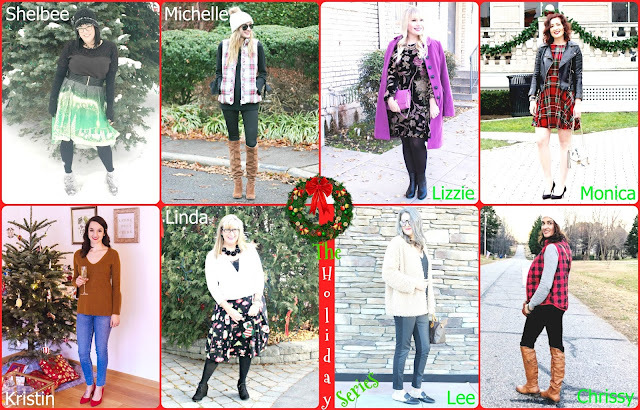 The first week we shared our Thanksgiving Outfits, next we shared our Black Friday Outfits, then we did our Holiday Home Tours and then a week ago from today, we shared our Holiday Winter Wedding Outfits. Today is the 5th edition of this beautiful, festive and stylish series and I am joined by ALL of the participating bloggers, there is a total of 15 bloggers. Today we are all sharing what we will be wearing or plan to wear for Christmas, this year. You will see everyone's outfits in detail below, but I wanted to start by saying how I saw so many similarities among our looks. For example my outfit is very similar to Chrissy's, Jennie's and Michelle's. All four of us chose patterned vests to wear over sweaters with skinny jeans and tall boots. Chrissy and I even have on our Red Buffalo Plaid Vests over a Fair Isle Sweater. Some of the ladies chose graphic tees/sweaters. There were lots of boots and beanies in the mix too. And some ladies dressed up their pants and some wore heels. I think everyone wanted to look put-together while staying very comfortable. I think my absolute favorite outfits belong to Roxanne and Lee. Ada: "Christmas is my favorite holiday - as if you didn't guess by how I decorate - so of course I had to wear an outfit that says Christmas. Fair isle and red buffalo plaid do that for me. The red gloves are a bonus. I had to be comfortable too for all the yummy food we will eat and since I will be spending Christmas at home this year with my immediate family, I chose a simple+casual look. Gëzuar Krishtlindjet!! That means «Merry Christmas» in Albanian." Christine: "This romantic Victorian inspired outfit is perfect for a casual Chic Christmas. I absolutely love the delicate écru lace blouse and black velvet combination. It’s a chic alternative to any holiday dress outfit. Joyeux Noël! " Whitney: "This year I'll be sharing double the love since I will be spending Christmas Day with my boyfriend's family as well as my own! We will be hopping from family party to family party so I need something to wear that is festive, comfy (for all that eating) and practical for braving the Michigan elements. " Kimberly: "On Christmas Eve I go out to dinner with my family I would wear this basic, classic outfit. As a coat I will be wearing this leopard coat. It's the warmest coat I have and it was a great buy. It's about 20 years old. On Christmas I go for a more casual look and like to be comfy." Roxanne: "I am going to be away in Munich during Christmas, but here is a festive look that I will be posting on Glass of Glam soon! I am Jewish so I don't celebrate Christmas, but I like to partake in festive outfits and go to holiday parties! This red coat screams "holiday" to me!" Kellyann: "I host Christmas Day at our house so not only do I want to be comfortable but I want to look good as well. 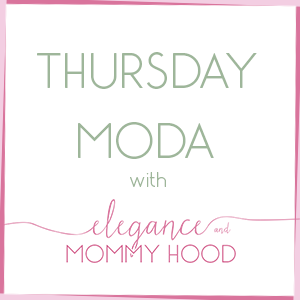 Since I have no idea what the weather will really be like that day - it could be 80 or it could be 50, welcome to Florida - I chose a lightweight sweater with fun sleeves and faux leather leggings." Jennie: "Over the years I always dressed up for Christmas to make the event even more special, especially as there were multiple family events over the day. The past couple of years I have been drawn to more comfortable looks as I now host the family celebrations in my home. My cranberry polka dot vest and plaid scarf bring some festivity to my comfortable jeans and boots." Shelbee: "I never was a fan of holiday-themed clothing at all, but this year I decided to go outside of my comfort zone for my Christmas outfit. I chose this adorable black and green dress from Rosegal which features a festive winter scene on the skirt. It is short sleeved so I layered a long sleeve back tee under it for extra warmth and my silver velvet booties complete the look perfectly. 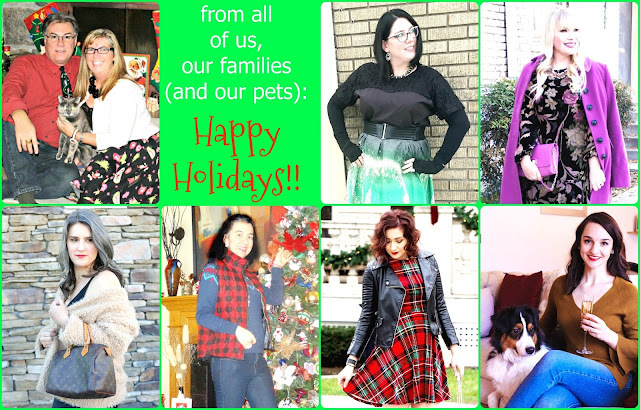 Happy Holidays to everyone!" Kristin: "Our last two years in Germany we have had friends and family come visit us for Christmas. This year my husband and I will be enjoying the holiday by ourselves (along with our pup) so we will make a nice dinner at home and pop some champagne. That's why I'm keeping it casual with a bell sleeve sweater, jeans, and red heels. Happy Holidays, everyone!" Michelle: "I love this layered look for picking a Christmas tree, Christmas caroling, walking around the neighborhood to see the Christmas lights or any other outdoor activity around the holidays. 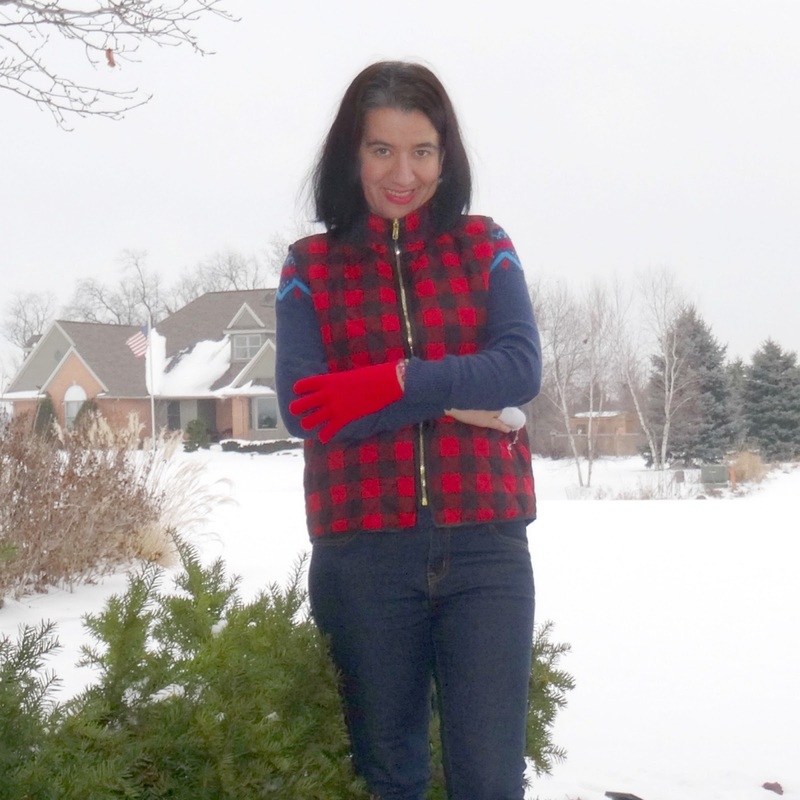 This look is casual but still festive thanks to my plaid vest, cozy hat and red lip! Finish it off with a hot cocoa to keep warm!" Linda: "This has been my Christmas Day outfit for the last three years. A skirt I found at Winners ( TJMaxx equiv) over a decade ago but on that is timeless. Sometimes I wear it with a black cashmere sweater or with a white lace sweater. I love the festive yet fun look of Santa and the skateboards. Merry Christmas from my home to yours ( and from Lou too)." Lizzie: "I love untraditional holiday looks and think this look would be perfect for Christmas Eve! I adore the velvet and sparkle with the unexpected color combo and print." Lee: "This year we are spending Christmas at the beach. I am packing light with comfortable clothing. This outfit is perfect for any occasion. I love leather front leggings and this faux fur coat paired together!" Monica: "Merry Christmas to those of you who celebrate! Christmas is such a special time for me because growing up we had a lot of traditions in our household and some of those traditions I've taken with me in my own home with my fiance and fur babies. I hope everyone has a great Christmas!" I want to start by saying that I love this outfit. I have been wearing puffer vests since I was in middle school and wear them even more now as an adult (especially the last 6-7 years), I own a lot of puffer or quilted vests -- bright colored ones, neutral solids, patterned ones too. This outfit is very me and one of my "uniforms". 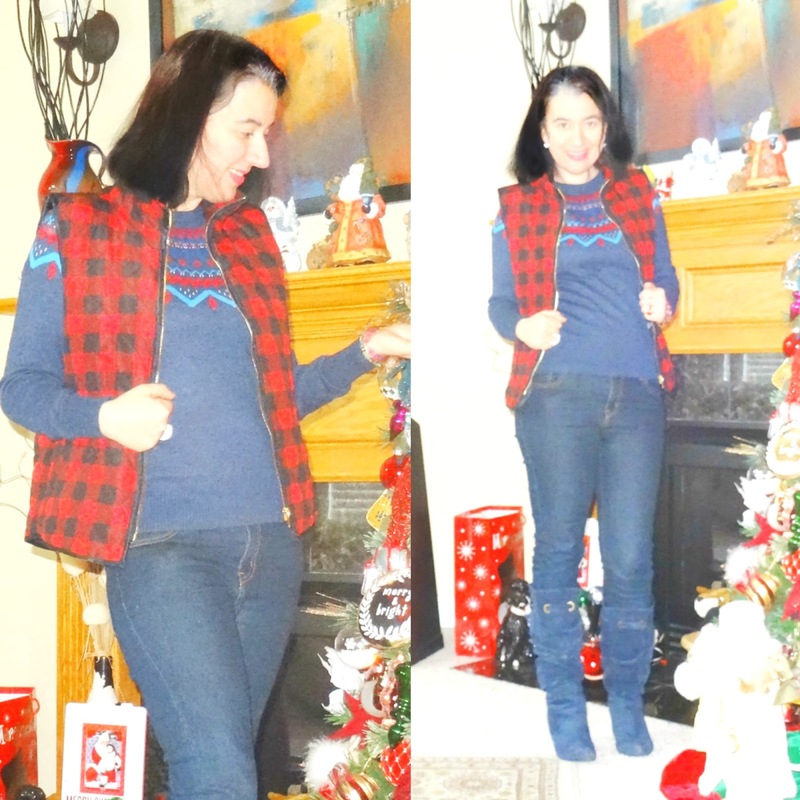 I have also gotten a small collection of fair isle sweaters in the last few years with this deep blue one (in red and turquoise fair isle pattern) from Merona (via Target) from December 2016. 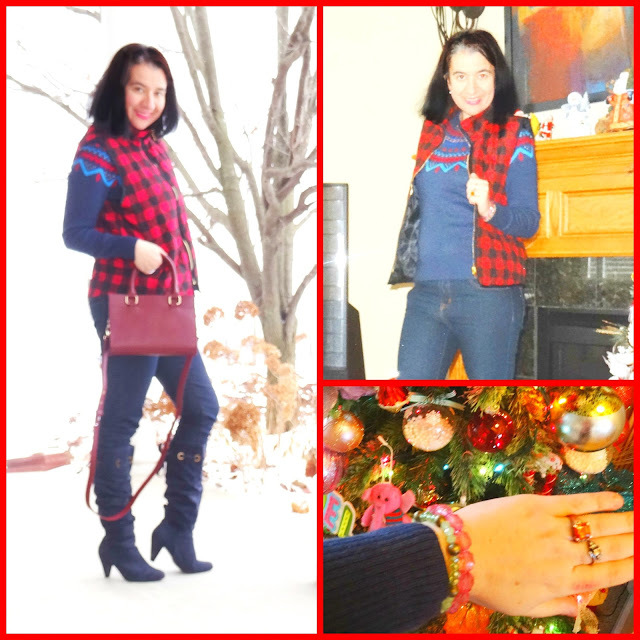 Both a Fair Isle Sweater and a Buffalo Print say Christmas to me as does lots of red. This outfit is mostly in blue (and red) since I paired my Dark Blue Skinny Jeans with my Dark Blue/Navy Ruched Knee-High Boots. But of course I added more pops of red besides the vest. I have on Bright Red Gloves and my Dark Red Faux Leather (but very well made) mini luggage-style purse. And the way I keep warm with just a sweater and sleeveless coat is by layering a tank top and a long-sleeve shirt underneath it, because as you see it was snowy and quite cold. Last but not least, Silver Zirconia Jacket Ear Studs and a Bright Pinkish-Red Lip were all I needed to finish off my outfit. What do you think of my Christmas Outfit?! Hope you like it and I hope you check out all the other ladies' outfits too, so much inspiration and beautiful photos, too. I love how a lot of the ladies took photos at their beautifully-decorated homes, close to their Christmas trees, among presents, or with a glass of bubbly. I also love seeing the beautiful fresh snow on the background of some of these beauties. I myself took both outdoor photos among our white coat of snow and indoor by the beautifully-adorned mantle next to the Christmas tree. The last installment of "The Holiday Series" will go live in a week - December 27th - and it is all about what to wear on New Year's Eve. I cannot wait to come up with a fun and sparkly outfit! 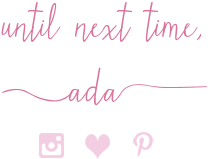 Stay tuned and Happy Hump Day - the second from the last of 2017.